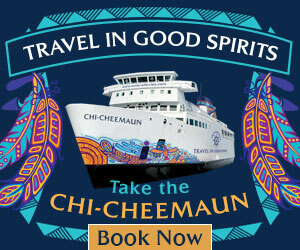 Can you spell humorous and heartwarming? | Rrampt. Home Culture Can you spell humorous and heartwarming? Picture yourself walking into a theatre and you are suddenly transported back to your elementary school gymnasium, fully equipped with banners, bleachers, and a healthy dose of adolescent nostalgia. 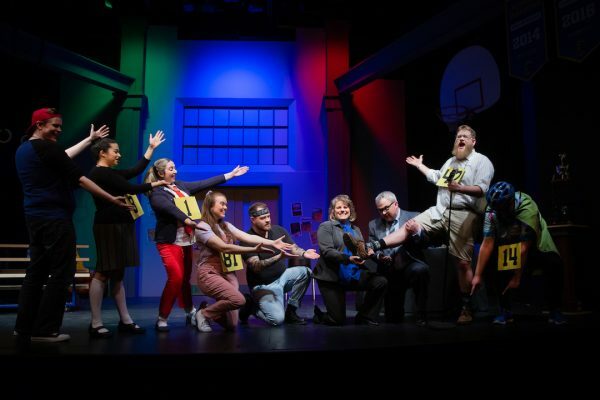 This is the exact scene I stumbled upon when I ventured to the Roxy one evening to chat with Cory Laycock, Lacey Mooney, and James Blue about the upcoming production of The 25th Annual Putnam County Spelling Bee. 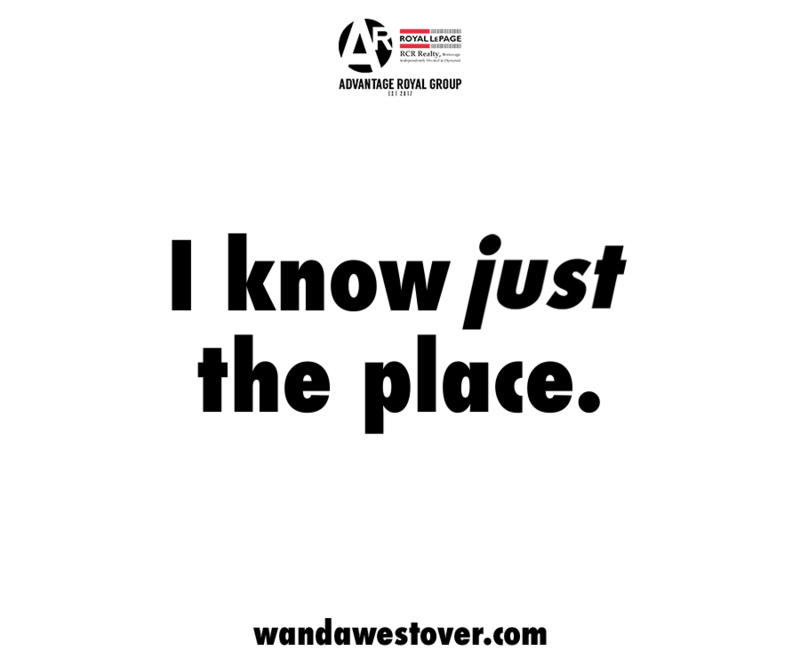 As the cast and crew worked at fitting mics and piecing together the dynamic set on stage, it was clear that there was something exciting underway. 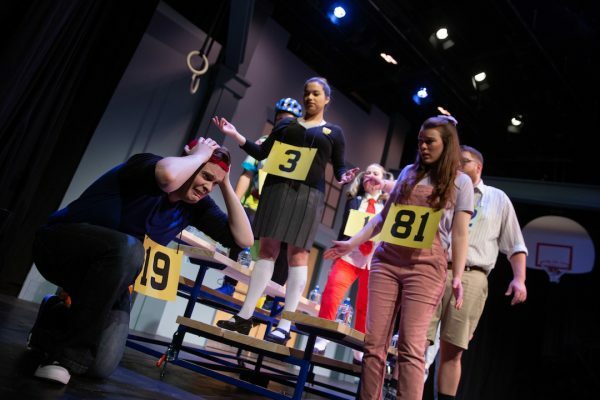 Spelling Bee is a Tony Award-winning modern musical that follows a group of middle school students as they navigate their way through an intense – you guessed it – spelling bee competition. 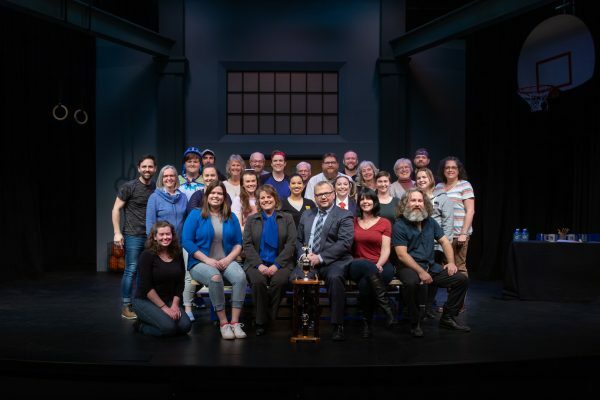 Laycock, director of the production, has spent over a year working out the details to bring the production to Owen Sound Little Theatre. He saw the musical multiple times and appreciated how adaptable it could be. Although the characters are mostly children, they are played by young adults, adding a whole other level of quirk to the show. Laycock believes that this will help Spelling Bee appeal to a wide audience – from long-time OSLT supporters, to first-time theatre goers. 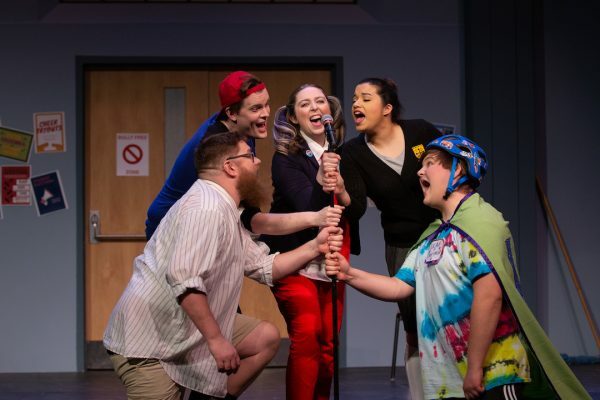 Lacey Mooney, producer and one of the musical directors, reinforces the lively aspect of the production, adding that anybody who enjoyed OSLT’s Spamalot will surely enjoy Spelling Bee. She adds that much of the show’s hidden messages focus on parent-child relationships and the connections between people. 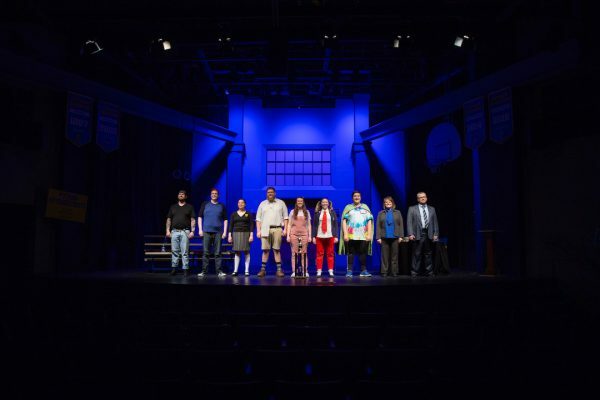 Humorous and heartwarming, Spelling Bee will resonate with anyone who goes to see it. Blue echoes the entertaining vibes of the show, joking at his own example of being “a big, bearded, tattooed guy playing a twelve-year-old.” And, despite the stress of finding a work-life balance, there has been overwhelming support from everybody involved in the production, a sentiment that is ultimately echoed on stage. I’m not sure if I’m brave enough to step up, but for those of you who are waiting for your chance to shine or show off your spelling skills, a sign-up sheet will be available before each show starts. 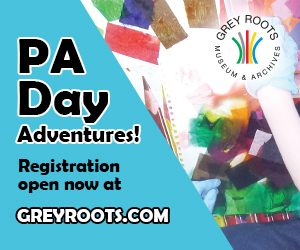 Get there early! Of course, I can’t write about a musical without mentioning the music. Although it’s only a cast of nine, Spelling Bee boasts an impressive 26 songs! In fact, the first eight weeks of rehearsal were spent on the music alone. Mooney has taken on the role of vocal coach for the cast, while Don Buchannan and Gord McConachie have lent their talents to form what Mooney calls “the musical trio.” It’s all about teamwork. Laycock explains that one might think it difficult to pull off so many musical numbers with such a small cast. Right from the beginning, though, he was blown away by the amount of talent they have. “They sing like the wind!” he says, impressed. Almost on cue as the interview wraps up, the voices on stage burst into harmony. I’m floored by this little preview. All of the energy and camaraderie within the production are heard in those notes. This will definitely be a show worth seeing! 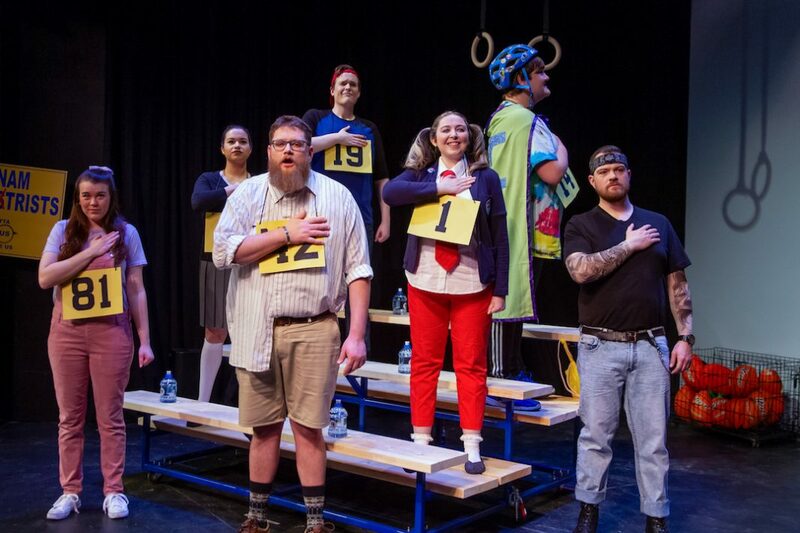 The 25th Annual Putnam County Spelling Bee runs from March 28th – March 30th, April 3rd – 6th, and April 11th – 13th. Tickets are available at the Roxy Theatre.